Ooooh! Circles! Yeah, I know, some of you are saying, "Yuck! Circles! They're SOOO hard!" Nah, you have NOOOO idea how easy it is to learn how to work around circles. tee-hee! Like most of the other things with math, it is the vocabulary that's key to working with circles. 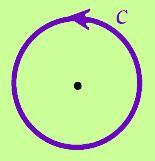 circle: a set of points in a plane equidistant from a given point. The center of the circle is called the origin. It is where all of the points originate from. Simply take a circle's circumference and divide it by its diameter and you have come up with Pi! In the following activity you will get to actually SEE what this means. It is a cool way to explore the concept of π and also give you a neat little reminder to keep in your notes to help you with your vocabulary as well! Step 1: Wrap the strip around the can. Take the strip of paper and wrap it around the can. 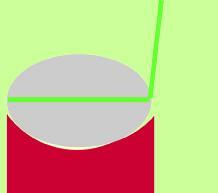 Using the strip, measure the distance around the can and cut off any excess paper that goes beyond the distance. This length is called the circumference. Now, with the ruler, measure the length of the strip using centimeters. Write C = and the measurement in centimeters onto the paper strip. Cut off the excess (extra paper). Circumference is the distance around a circle. It is a linear measure. For demo purposes, let's say our can here has a C of approximately 26 cm. Step 2: Measure across the top of the can. Take your Circumference strip, the same one, and measure across the TOP of the can. This measurement is called the diameter. The diameter is the distance across the circle, through the center. Where the strip hits the edge of the can, where you actually have the diameter, FOLD the strip. Make a mark with your pencil along the fold. 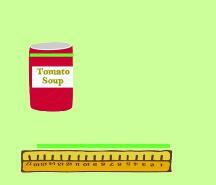 Measure the the diameter using your ruler and write it down onto the strip as d = . Step 3: Fold the strip the length of the diameter. BEFORE you begin folding, estimate how many times you think you will fold your circumference strip the length of the diameter? Okay, now try it and see. On my can, the C was approximately 26 cm and the d was approximately 8.25 cm. When I folded the strip the length of the diameter, I was able to fold it three times and there was a little bitty bit left over. How about you? Okay, now take out your calculator because we want to find the ratio. What was your quotient? Did you get something around 3.14159? I bet you came pretty close. P.S. π is NOT 22/7 and it is also NOT 3.14. These are both approximations. If you want to use a 'good' and accepted approximation in your calculations, use the first five decimal places.